Hello INAKA, my old friend. If anyone's wondering, yes, I do have machinations to someday get back into the swing of things and update this blog at least semi-regularly. The problem I've had lies within the title itself: I'm not a kid anymore. So this means working full-time and trying to make enough to get by. I work, I come home, I eat, some days I go to Japanese class, I drink, I pass out. Weeks just whiz on by in this year of 2014, a year I would declare as ultimately one of the most disappointing of my life. I hold years ending with the number 4 to a lofty standard, and whereas 1994 and 2004 hover near the top in ranking my life, 2014 just sits in the lower third, an unfortunate victim of unrealistic expectations. The second issue with blogging about toys is, as you may recall, I moved out of home two years ago. And unfortunately for my dad, I've left all of my junk there. It becomes more than a little odd when I visit him and devote time to frittering through tubs of toys, or bringing them back here to my apartment solely so that I can get rid of them. But we'll see. The blog is never dead, in my mind. Sometimes, it's just a little bit like a sloth. It's covered in moss and lacking in ambition, but eventually, it will end up going somewhere. Also, sometimes I end up with things like this. Yes indeed, TURTLE BALLS. I saw these a short while ago and thought they were too awesome (radical, even) to pass up. I don't know what I'm going to do with them. Chances are solid they will simply sit in the closet, only occasionally appearing in an effort to frighten intruders with the visage of a grinning, decapitated Leonardo. Part of me wants to give one to each of my four children (children who don't currently exist beyond Cynthia and Morgan on Fire Emblem Awakening), passed down through the years as the line divides, a reminder of the bonds of family and the eccentric consumerism of their demented ancestor. ...But that takes too much effort, I think. Enjoy the closet, boys. 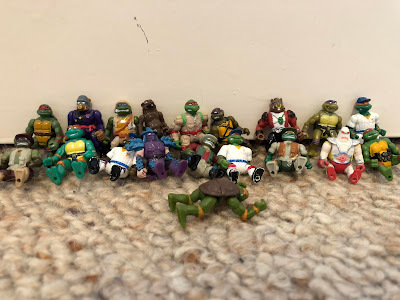 Those are made all the more awesome by the image of them being the remnants of the Turtles decapitated! Your ancestor T0-N33 of Alpha Centauri is a lucky Mandroid to receive one of these after 3,453 years of being passed down from generation to generation. This comment is best comment!